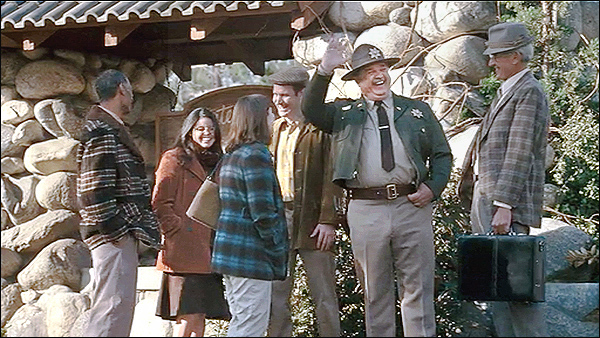 "Nancy Drew", the 2007 movie version of the classic girl sleuth's adventures, starring Emma Roberts, is a virtual treasure trove of Los Angeles filming locations. That might seem odd, since the original Nancy Drew stories took place in Nancy's fictional Midwestern home town of River Heights. But in the movie, Nancy and her Dad temporarily leave River Heights and move to Hollywood, where Nancy gets caught up in an old mystery surrounding the death of a movie actress. 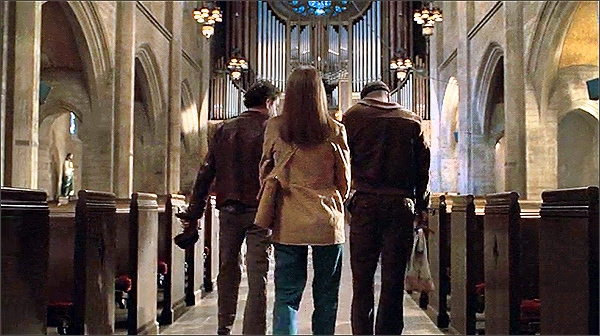 The movie opens with Nancy in a River Heights church, negotiating with two bungling burglars who were attempting to rob it. This is an actual church, but far from the midwest. This is actually Calvary Presbyterian Church, at 1050 Fremont Avenue, in South Pasadena, California. As the name suggests, the city of South Pasadena is just south of the city of Pasadena, California, the home of the annual Tournament of Roses Parade and the famed Rose Bowl. South Pasadena has a midwestern look to it, right down to the architecture of the homes and the kind of trees that line its streets, so the town is a frequent filming spot for movies and TV shows that are set in the midwest. In this case, it is playing River Heights. [0:03:27]. They didn’t bother to change the church name on the sign out front for the movie. As you can see in the screencap above, it still bears the actual name of the South Pasadena church. Given the clergyman's collar, Irish accent and name of "Father Murray", my guess is that they meant it to be a Catholic church, and just didn’t think about changing the sign out front. [0:02:02] - The short scene where the cop cars (and fire trucks) are racing to the church was shot with those cars heading west on Mission Street (across train tracks) at Meridian Avenue, in South Pasadena. Here is a Google StreetView of that intersection. The sign is on the southwest lawn, which is on the same south side of the church where Nancy rappels down from the church roof, to the applause of onlookers [0:05: 37]. 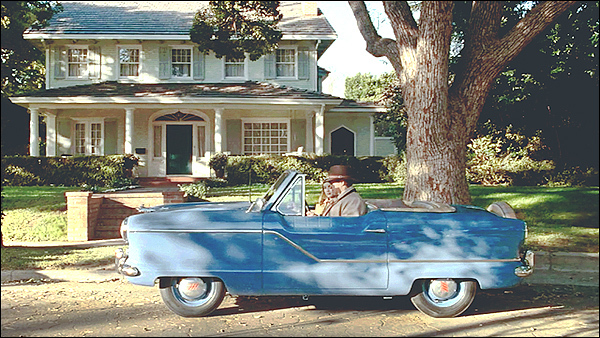 [0:07:42] - Next, we see Nancy’s father driving her along a tree-lined street (in a vintage blue convertible) and up to the front of a suburban house (that appears to be the Drew family home in River Heights). You'll find this house at 1002 Highland Street, in South Pasadena. That’s the northeast corner of Highland & Meridian. 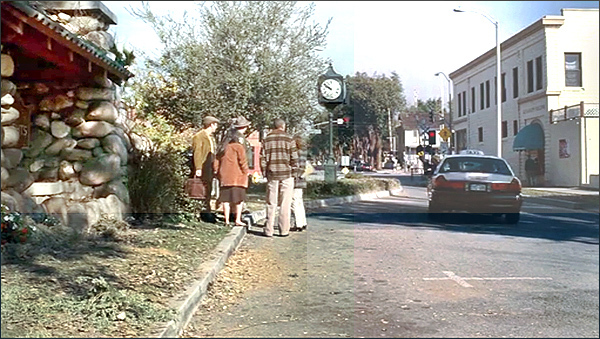 [0:10:25] - As Nancy and her father drive out of River Heights (and the locals wave goodbye), we see a sort of town square, with a grassy area, a smooth stone structure and a large green clock. 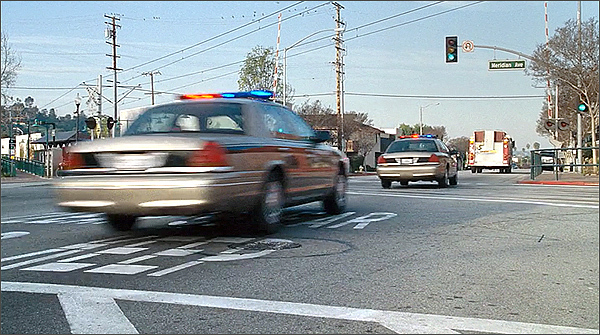 This scene was actually shot immediately south of the intersection where they filmed the police cars speeding past. We are looking north on Meridian Avenue, from just south of Mission Street, around 913 Meridian. The Drews are driving north up Meridian Ave.
That grassy area is a curved center divider, and the green clock is located on that divider. That rocky structure is a local landmark known as the "Watering Trough and Wayside Station", and back in 1906, when it was erected, it served as a resting spot for those driving carriages. They put up a fake sign reading “River Heights” in the center of that waystation (although you can’t really read it well). Here is a Google StreetView of the spot. [0:11:03] - Nancy and her father arrive by train. Then there’s a fast forward musical montage (with the song “Come to California” playing in the background), as the Drews drive through L.A.
[0:11:30] - The first shot is of the corner of Broadway & 7th Street (you can see the Golden Globe Jewelry Plaza, at 700 S Broadway), as they head southeast on 7th, and pass Broadway. [0:11:36] - The next shot in this musical montage is shot from the Wilshire Blvd bridge over the Harbor (110) Freeway. (Oddly, they seem to be moving east instead of west.) The camera is looking southwest. [0:11:51] - and finally a shot of the Hollywood sign (taken from the far east/southeast, probably from Griffith Park). [0:12:23] - They arrive at the Draycot mansion, where the Drews stay while they're in town, and where a lot of the movie takes place. In the film, this is the former home of the movie actress Dehlia Draycot, who was murderered twenty years ago. The mystery that Nancy tries to solve is who killed the actress, and why. They changed the appearance of the home, of course, making the yard look overgrown and neglected. [0:21:33] - Next, we see the high school which Nancy attends while she's in L.A., as well as the sports track behind the school, where Nancy outraces her jealous classmates. This is Hollywood High School, at 1521 N. Highland Ave, in Hollywood (at the northwest corner of Sunset & Highland). 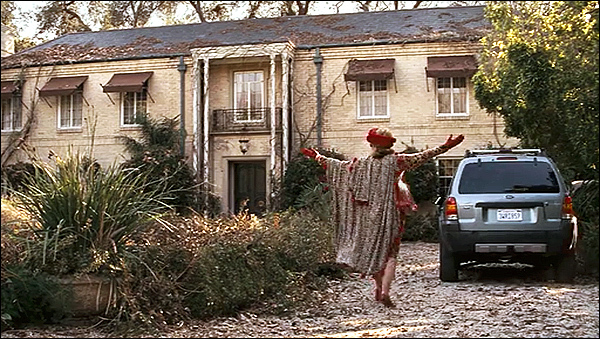 Despite the Highland Ave address, this particular entrance, which we see in the film, actually faces Sunset Blvd. 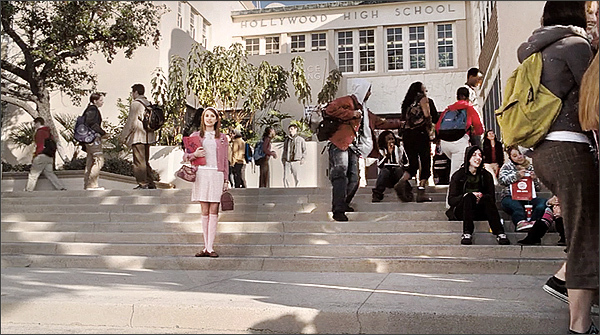 The scene opens looking east down Sunset, as students walk towards the high school, then the camera pans north to show the school's south entrance steps (which is where the other girls first see Nancy and give her odd looks because of the way she's dressed). 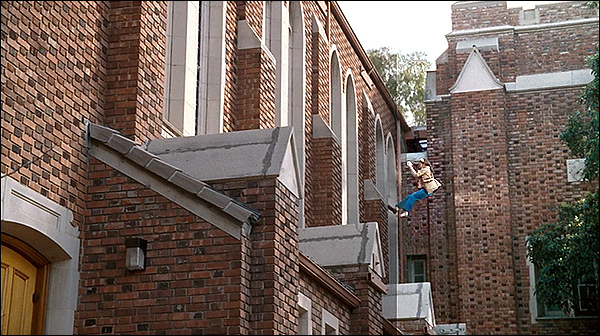 [0:21:58] - The scenes of Nancy running track were shot on the school track behind (northwest of) Hollywood High. The camera is looking west/northwest. [0:34:02] - She and Corky are seen walking south down an unusual street. Nancy wants to ask a question of someone working on a movie being shot there. This is L.A.'s famous Olvera Street (after dark) - which is located just north of downtown L.A., and right across the street from Union Station. Olvera Street is the historic, original Mexican plaza where the city of Los Angeles was born over 200 years ago. It contains some of the oldest buildings in L.A. The official address is 845 Alameda Street, but that is somewhat deceptive. Alameda Street actually runs along the east side of Olvera Street, while Main Street runs along its west side. Olvera Street is sort of an alley in between those two streets, which has been transformed into a colorful celebration of the city's Mexican heritage - and a tourist mecca. 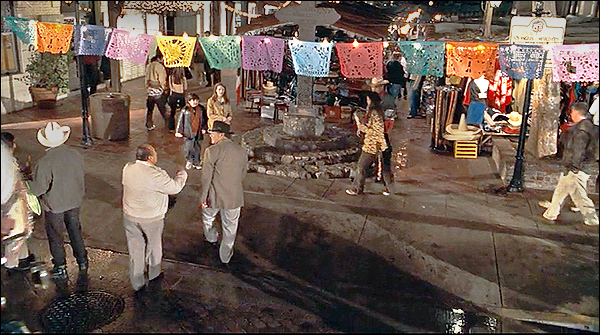 In that opening shot, they are at the south end of Olvera Street, where it opens up into the Plaza. Just as they walk out into the Plaza (in front of the Methodist church), they are accidentally swept up in the period movie that is being shot there, by an assistant director who assumes that Nancy is a movie extra. [0:34:34] - Nancy is herded east, away from the Plaza (across Alameda Street) to the movie set on the steps of Union Station, where Nancy has an encounter with Bruce Willis (who plays himself, making a movie). 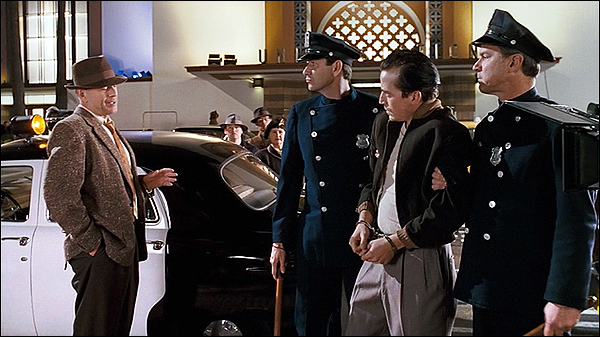 Bruce is filming a scene set in the 1950's, where he is reading the Miranda rights to a crook he just arrested. 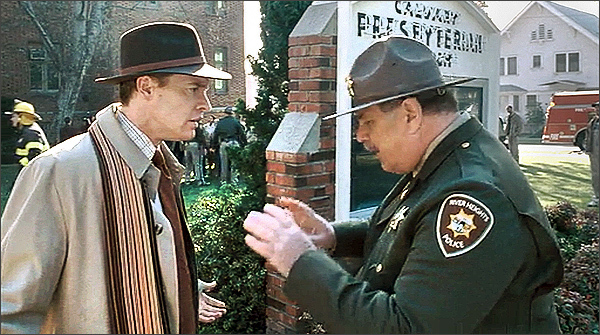 But Nancy butts-in and tells Bruce that police didn’t read Miranda rights to suspects until 1963. While there, she spots a major clue in the shadow of two crossed palm trees. Union Station is L.A.'s central train station, an Art Deco treasure located at at 800 N. Alameda St., in downtown L.A. Here is a Google StreetView of the Union Station. More Nancy Drew locations on the next page! The photos on this page are stills from the DVD of "Nancy Drew" and are copyright Warner Bros.